Why Designers HATE Comic Sans. Talk to any graphic designer and you will get this repeated again and again. We HATE Comic Sans, and when I say HATE what I really mean is MEGA-LOATHE Comic Sans. The Abomination Font. The Pariah of the Design world. At once one of the most popular fonts in the world but also the most hated. But what a lot of people don’t understand is why designers hate the font so much. (And FYI, the following can also be applied to Papyrus and that cursed font Bleeding Cowboys). Ok, before I start lambasting the damn font, I may as well argue both sides of the coin and give you all a little bit of information about said font. 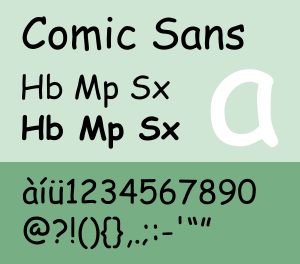 Comic Sans in its original incarnation was a typeface used by the American comics industry (hence the slightly obvious name) and was included in Windows 95 and everything since then. It was designed to imitate the look of comic book lettering for use in, and this is the really important bit, informal documents. And on that last bit is exactly where it all falls apart. Informal documents. Designers of any calibre will all tell you that each font or typeface you choose to use in a design such match the tone or type of the design. Serious signs should use serious typefaces, just like serious documents or informative documents. Designers of any calibre will also tell you that actually they don’t really hate Comic Sans, instead what we as a group loathe about Comic Sans is the fact that people insist on using it everywhere, even when it is not appropriate, for now better reason that “because it looks fun”. Comic Sans is a font for school children and silly little things. And It’s not even a particularly attractive font at that. Yet everyone seems to have this idea stuck in their heads that Comic Sans is a great font that can be used to spice up an otherwise boring document. WRONG. Mike might be right, you aren’t all designers, and you don’t have Fonts like Helvetica sitting around on your PC, but guess what you do have. Calibri, Sans Serif, and even at a push ARIAL. Oh, crap…no wonder I never get taken seriously. This was like having a Freudian-style graphics analysis done. Painful but enlightening…thanks! Haha, glad I could help! man! good to know I’m not the only one hating this font! sad to say, but i’ve seen this on resumes! If someone gave me a Resume with Comic Sans used on it, it would go STRAIGHT in the Shredder!